Roman Republic. L. Julius Bursio. ca. 85 BC. Reference : Sear-268. RSC-Julia 5. Size : 18.3 x 21.4 mm. Weight : 3.77 grams. Obverse : Male head right, that appears to be a composite of Apollo (laurel wreath), Mercury (wing on head) and Neptune (trident), with a cluster of grapes as a control mark weakly struck in the left field. 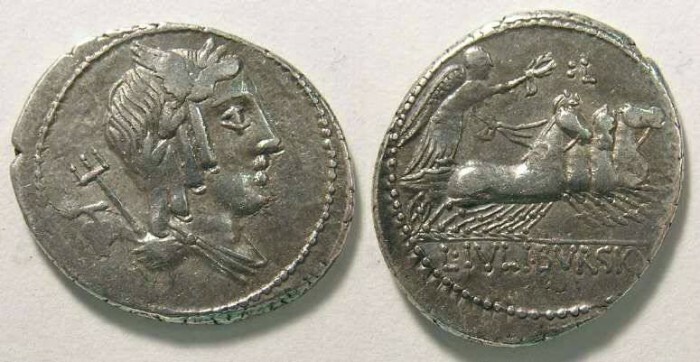 Reverse : Victory holding a wreath, while driving a quadriga right, with L IVLI BVRSIO below, with a control mark of a L with two dots behing it, in the upper right field.